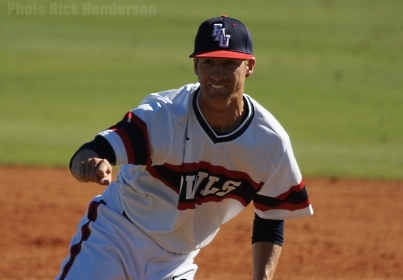 In what would best be described as a major reversal of fortune, the FAU baseball team executed a double steal in the top of the 11th inning which scored Cain Spangler and enabled them to down nationally ranked Florida 5-4 on Tuesday night in Gainesville. The Gators (19-10) were 5-1 against Florida Atlantic Head Coach John McCormack entering the contest, while riding a four game win streak against top five programs FSU and LSU. Meanwhile, the Owls had just overcome a losing streak of five games - their longest in three seasons - the contest prior to Tuesday. Making the moment more meaningful pitcher Kevin Alexander (pictured), who returned to action after missing two weeks due to illness, earned the win. Alexander tossed three innings and gave up three hits, but struck out two batters - the Owls had only three for the entire game. Offensively, CJ Chatham was 2-of-5 with 2RBI, and Esteban Puerta, Cain Spangler, and Brendon Sanger each drove in a run. Ironically, FAU (16-12) registered a season high 19 strikeouts, although they did outhit the home team 14-9 in addition to outscoring them. Florida took a 3-0 lead in the bottom half of the first inning, but the Owls chipped away later to tie it up in the top of the sixth. UF immediately moved ahead again with a run in their next at bat, but the Owls countered that effort in the 7th. With the game on the line and speed on the bases, McCormack called for the double steal after three scoreless frames later in the 11th. Florida Atlantic next returns to conference play with a three game road swing against Marshall beginning on Friday night at 7:00 PM.